I've been reading FiveThirtyEight since this fall; I know it's been around since 2008, and I discovered it in 2012 (my wife: "he doesn't say it, but I'm pretty sure this guy's a Bayesian"), but it was the utter mess of the Republican primary, and the fact that I felt more invested in the Democratic primary than I had been, that shifted me into being a regular reader of the site. Yet Nate Silver was as wrong as many others, predicting a Clinton win that turned out to be mistaken. As opposed to Nate Silver, Scott Adams predicted a Trump landslide win. So Scott Adams was clearly right and Nate Silver was clearly wrong. Or was he? 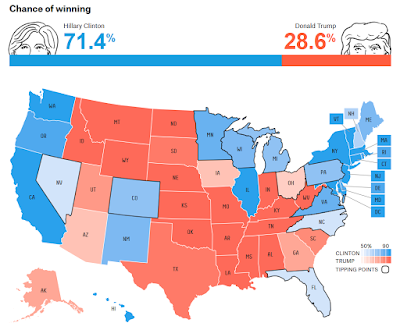 Nate Silver's final forecast was that Clinton had a 71% chance of being elected president. He wasn't predicting a Clinton win; he was predicting that if there are 100 possible president elections, Clinton wins 71 of them. Was he wrong? We could be residing in one of the 29 other worlds. How would we know? How is it possible to know that? Scott Adams may have said Trump would win-- but he said that Trump would win in a landslide. I'm not exactly sure how big is a landslide is, but I am pretty sure that slightly losing the popular vote isn't one. Also, not to get too ad hominem here, but Silver's prediction was based on polling, and you could have faith in it based on past success-- Adams's claim to fame is writing the comic strip Dilbert. I enjoy the bits where they belittle Asok the intern as much as the next guy, but it hardly requires intellectual rigor. My instincts tell me that despite appearances, Silver was more right than Adams. The thing that bothers me is that there's no way to be sure. To my eyes, it looks like the final popular vote margin was within the "80% chance of falling in range" section on the final FiveThirtyEight prediction. And, you know, if Silver believed an event he predicted as having 71% probability, that would mean he would be wrong about three of every ten times. This is the third presidential election Silver's predicted, and 71% * 3 = 2. So it seems he was due to get it wrong. I guess if he calls the next seven elections wrong, we'll have more room to doubt him. 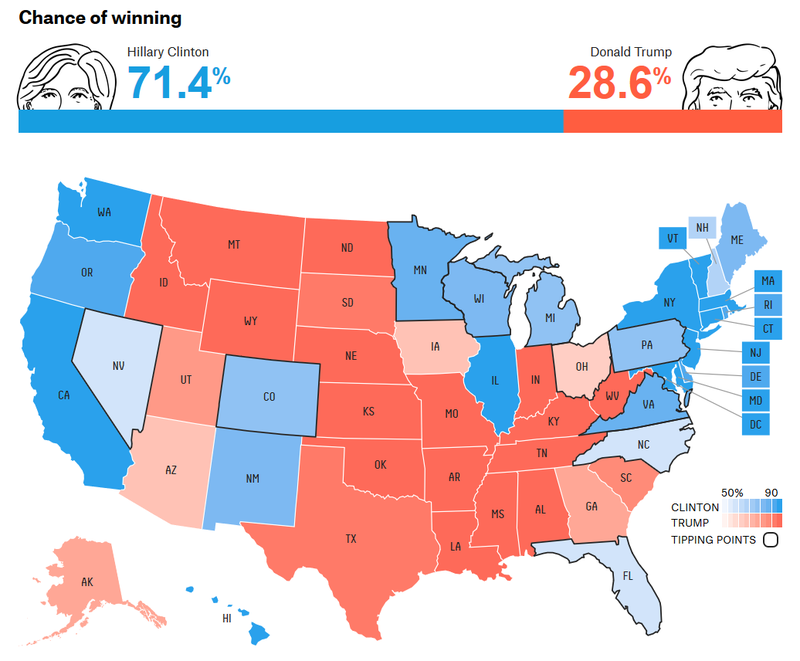 It seems very possible to me that Nate Silver wasn't wrong in any meaningful sense. 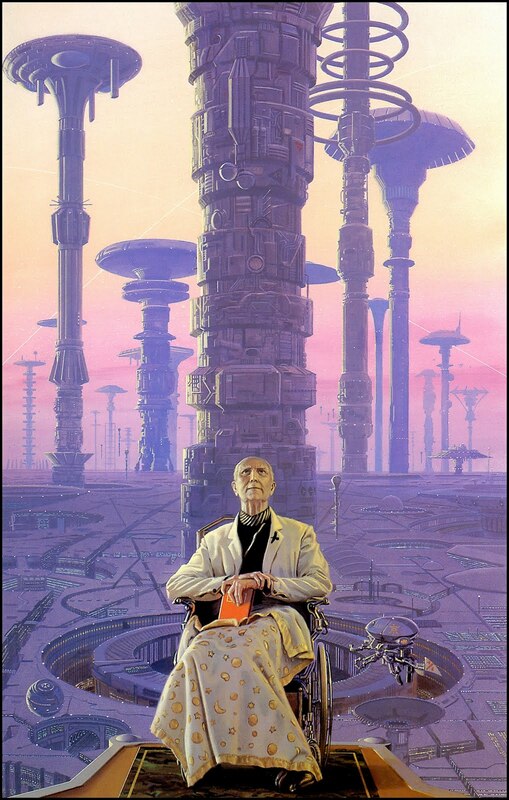 But who knows-- we could be living in one of those 29 other worlds, or we could be living in one of 99 worlds that Trump won. Or maybe the guy who said Clinton had a 99% chance of winning was right, and we're in the one world where Trump won. It seems unlikely... but surely that's what the very meaning of "unlikely" implies, that it can happen. So I guess this is what bothers me about statistics. We don't just say events will or won't transpire; we assign them probabilities, but we have no way of testing that those probabilities were right. We can only say that the event did or did not transpire. We're a long way off from psychohistory. Presidential elections just aren't repeatable in the same way as many events we assign probabilities to. In All-Star Superman, Superman has a machine in the Fortress of Solitude where he can create virtual worlds to find out what they would be like. (He does it to find out what a world without Superman would be like.) But short of having one hundred of those on hand, and setting each one to run through November 8, 2016 again, we have no way of verifying these predictions. Though, maybe, we're in one of those simulations. After all, what are the odds? * Alternate caption: I guess Trump is just the Mule of Nate Silver's psychohistorical predictions. Hayl: he's totally a Bayesian. Steve: I have been yelling about running statistics on an unrepeatable single event like this ALL campaign season! !